Shopaholics unite! For every $60 you spend, you’ll get a FREE Sale-A-Bration product - there are nearly 20 to choose from!! Visit my Online Store to start shopping. BONUS: For a minimum $200 CAN order, you’ll also get a FREE pack of Silver Glimmer Paper (silver paper for Stampin’ Up!’s silver anniversary!) on top of the SAB freebies and Hostess rewards. Plus, when you join Stampin' Up! during Sale-A-Bration, you’ll get 25% more products for FREE in your Starter Kit. Join Now to take advantage of this limited-time offer. 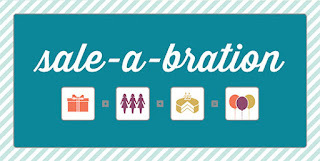 Sale-A-Bration is one of the most exciting times of the year at Stampin’ Up!